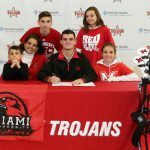 Nate Uhlenbrock and family after he signs letter of intent to play golf at Miami. 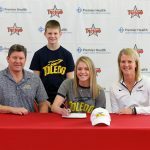 Camryn signs letter of intent to play volleyball at the University of Toledo. Jacob signs his letter of intent to attend and play baseball at Ohio Dominican University.